My assigned blog for the October reveal of the The Secret Recipe Club was Sweet Beginnings. Jaida’s recipes are sweet indeed, and I had a difficult time deciding what to make. I settled on scones after seeing this recipe, but did not happen to have any fresh or frozen blueberries on hand. So I decided to put the this concord grape jam I’d just made to use. I first thought I’d make plain scones with a layer of the jam in the center, but then it hit me: what’s better with grape jam than peanut butter? Why not add some peanut butter to the scone dough? I don’t eat that much peanut butter, but keep it in the house for my kids; I used organic, smooth peanut butter here (my favorite brand is Santa Cruz). So there you have it: my thought process in coming up with these peanut butter and jam scones inspired by Jaida’s bluberry lemon version. They’re pretty healthy and full of fiber since I’ve used a ratio of 2/3 oat flour (made from pulverizing organic rolled oats in my blender) and 1/3 whole wheat flour: if you want your scones to be gluten-free, make sure to use gluten free oats and substitute in a gluten free flour or flour mix for the whole wheat flour portion. 1. Beat egg and buttermilk together and set aside. 2. In large mixing bowl, whisk the flours, sugar, baking powder and salt together. Add the butter and the peanut butter and using a pastry cutter, fork, or your fingers, cut it into the flour until you have a pebbly mixture the size of peas. 3. Pour the egg/buttermilk mixture into the flour/butter mixture and stir to combine with a rubber spatula. It should come together into a sturdy dough (add a bit more whole wheat flour, if necessary to bring it together). 4. Turn the dough out onto a floured surface and divide in half. Roll each portion out into a disc. 5. 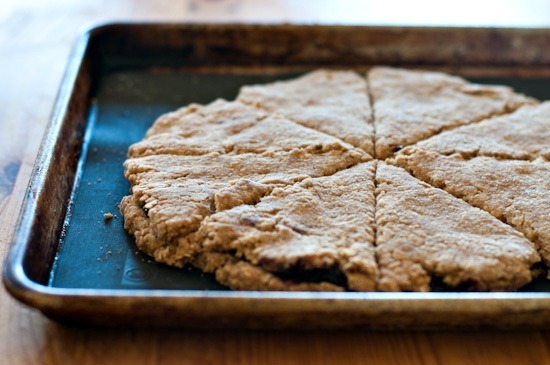 Place one of the discs on a parchment or silpat-lined baking sheet, then spread with the jam. You want it to cover the whole surface...I used 1/2 cup of jam, but you might need a little more or a little less depending on how thick your disc is rolled out. 6. Carefully transfer the other disc (I used a large flat spatula) to lay on top of the jam layer, then cut the disc into 8 triangular shaped pieces. 7. Place baking sheet with the prepared scones in the freezer overnight. 8. 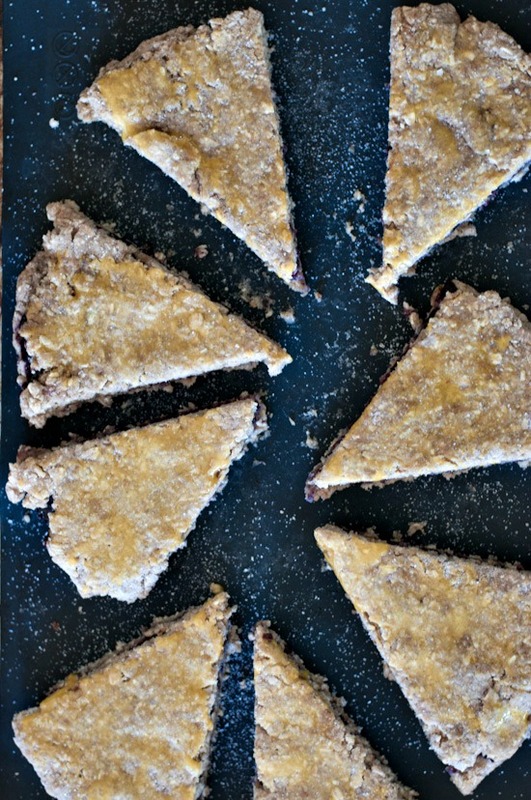 Take the sheetpan out of the freezer and preheat the oven to 350 degrees F. Separate the scones so they are a few inches apart and brush the tops with the egg wash. Sprinkle generously with organic sugar, then bake for 22-25 minutes, or until they are nicely browned on top. Inspired by Sing For Your Supper by way of Sweet Beginnings. I love scones!! I’ve never had pb scones though. But they look fantastic! These look delicious! Good choice for SRC. I thought I’d heard them all for scones, but this a clever and unique version!! I may make these for my lunches this week. If you want them to be very pb and j-ish, I’d add more of both next time. Let me know how they turn out if you do make them. These look really interesting Winnie. 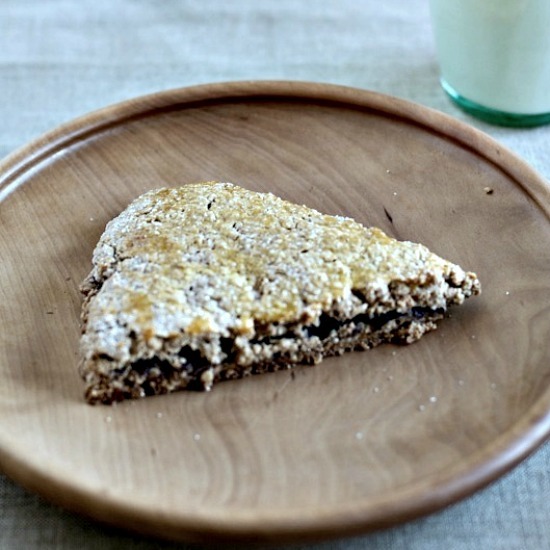 A completely different take on the usual scone. These sound like a great grab and go breakfast and also perfect for a lazy day kind of breakfast! Hearty, filling, and delicious. Great SRC pick! 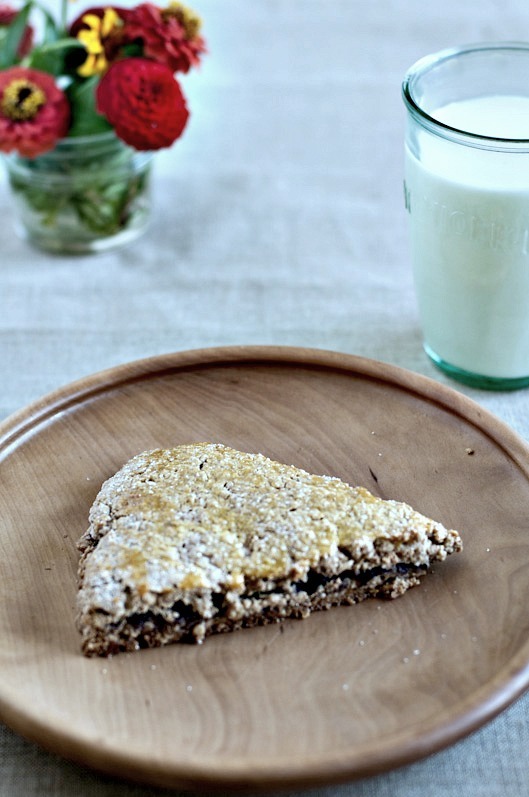 Very fun PBJ scones and using concord grape is the flavor from my childhood, love it. What a great idea Winnie! And so healthy too, you have some lucky kids! I think so…though they might disagree! These look so good! I love the nostalgic flavors at play. And such good use for your amazing jam! Aw, thanks Priya…that is super sweet! If only I wasn’t allergic to peanuts! Thanks! Nothing wrong with a really good pb & j, though…. oohhh….I know a few hungry mouths that would LOVE these (mine included)! WHat a fun idea. I like the idea of the jam layer in the middle and the peanut butter mixed through out. Thank you…your comments always bring a smile to my face! What a great idea! I love how you approached this. I’m thinking this will be PERFECT when my grandkids come to visit!! I’m going to add more peanut butter and more jam next time Suzanne…the flavors were pretty subtle this time around. Those must be extremely good! What a wonderful idea. I have mixed feeling right now. I’m so happy you shared this delicious scone recipe since we all love scones around here and in the same time I’m so jealous that you have concord grapes. They are my favorite grapes and I’ve been looking for them at the farmer’s marker since I got back from vacation but are no where to be found. They do so well in baking! This is the poetry of taste! :) Hey If you’re interested,learn how to easily bake a delicious and healthy chocolate cakes,especially for diabetics, Easy Chocolate Cake Recipes gives you a fantastic tips for making the original,rich and yummy chocolate cakes.